﻿ Judas Kiss streaming video at Border2Border Cinema with free previews. Failed filmmaker Zachary Wells is convinced by his best friend and hotshot director Topher into replacing him as a judge in their film school's annual festival. Zach's one-night stand with a student backfires when that student walks into an interview the next morning calling himself Danny Reyes, the name Zach went by when he attended the school. And Danny's film, "Judas Kiss," is a finalist in the competition Zach is judging. 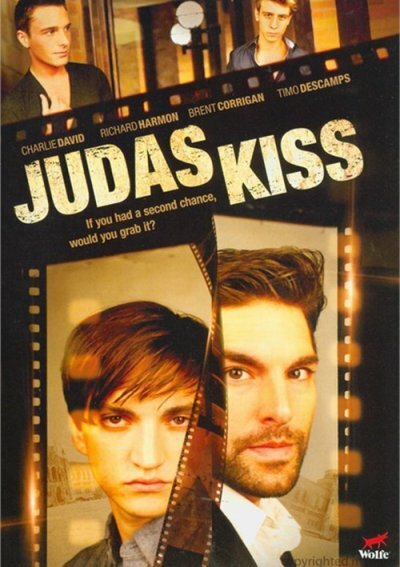 Zach's film, also "Judas Kiss," won the festival years before. As Zach scrambles for answers, a mysterious, chain-smoking campus tour guide, counsels him: "Change the kid's past, change your future." But how? Zach comes to believe he can mend his life by disqualifying Danny from competition, putting him on a different path than Zach followed. But will Zach's plan work?